Le Bus Direct (previously Les Cars Air France) are luxury airport shuttle buses that provide easy transportation from downtown Paris to Aéroport Orly (ORY) and Charles de Gaulle (CDG). The Le Bus Direct coaches usually run when trains are on strike! Getting to Paris’s two main airports Charles de Gaulle (CDG) and Orly (ORY) always seems a bit more complicated and complex than it should be (or actually is). Trains and local buses provide the cheapest public transportation but Le Bus Direct (previously Les Cars Air France) is a very comfortable option for passengers from Aéroport Charles de Gaulle and Aéroport Orly to downtown Paris. Le Bus Direct coaches also provide the best transit option for travel between Paris-Orly and Paris-Charles de Gaulle airports. Taxi2Airport and Suntransfers give easy online quotes – for groups as small as three or four a taxi may be a good and convenient option. 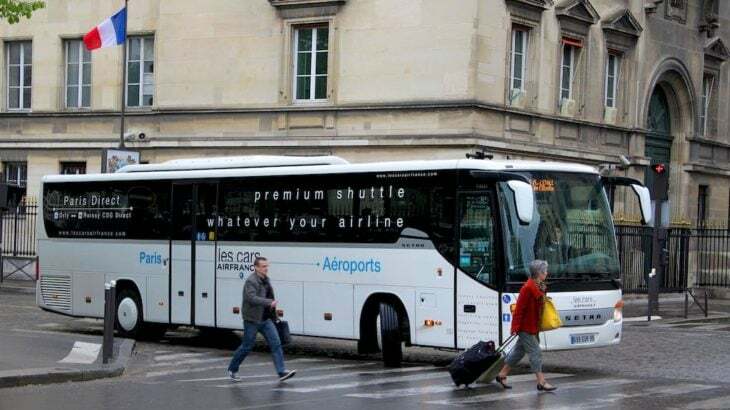 Le Bus Direct is a comfortable and convenient coach service between Paris airport and downtown Paris and replaced the previous Les Cars Air France buses. Tickets bought online is not for a specific bus and valid for a year. Tickets bought from the driver has a €1 surcharge. Children 4 to 11 receive a discount. Babies up to 4 year travel for free but does not receive a seat. Groups as small as four traveling together receive discounts if booked online. Return tickets are slightly cheaper than one-way tickets. Reservations for a specific bus time cannot be made – a seat is thus not guaranteed for a specific departure to the airport but similarly not forfeited when a flight arrives late. In contrast to the previous Les Cars Air France, Le Bus Direct does not stop at Invalides. Travelers from Paris-Charles de Gaulle Airport (CDG) can reach downtown Paris on public transportation for less than €10, however, after a long flight and especially when traveling with bulky luggage, Le Bus Direct’s slightly more expensive prices are often a price worth paying. Le Bus Direct coaches have UBS plugs, free limited wifi, air conditioning, special luggage compartments and are never overcrowded. Furthermore, passengers do not require transfers or dragging luggage up and down station stairs. However, for small groups a private airport shuttle service may be a viable alternative, especially if further transportation is needed from the downtown Paris stop to hotel accommodation. Many private airport shuttle minibus services are available from Paris to Charles de Gaulle and Orly airports – do compare prices as rates and service conditions vary widely. Taxi2Airport gives easy online quotations. Line 2 currently does not stop at Trocadero. The one-way fare for Le Bus Direct is €17 (€30 return) and for children €10 (€20 return) irrespective of which stop is used. Groups of four or more pay €13 one way – for larger groups a taxi or private shuttle van may work out cheaper. Line 4 coaches run from Gare Montparnasse (14 Rue du Commandant Mouchotte) via Gare de Lyon (20 Boulevard Diderot) to Aéroport Charles de Gaulle every half hour between 5:30 am and 10:30 pm. Traveling time for Line 4 coaches is about an hour. The one-way fare for Le Bus Direct Line 4 buses is €17 (€30 return) and for children €10 (€20 return) irrespective of which stop is used. Groups of four or more pay €13 one way – for larger groups a taxi or private shuttle van may work out cheaper. Passengers arriving at Terminal 3 should use the free CDGVAL shuttle train to Terminal 1. The free CDGVAL shuttle train connects the various terminals – get off at the right stop from the start as walking is rarely an easy option. Public transportation between Orly Airport and tourist Paris is even more confusing and involved than from Charles de Gaulle. Few tired passengers will regret using the more expensive Le Bus Direct (previously Les Cars Air France) coaches rather than train and bus combinations. Book Paris Tours and Transfers at GetYourGuide. Traveling time is around 60 minutes to Etoile or 30 minutes to Gare Montparnasse. Le Bus Direct coaches do no longer stop at Invalides, La Motte, or Porte d’Orléans. Le Bus Direct buses depart two to three times per hour on the Orly route from around 6 am to 11 pm. One-way fares on Le Bus Direct Line 1 are €12 (€20 return) and for children €7 (€14 return) irrespective of which stop is used. Groups of four or more pay €9 one way – for larger groups a taxi or private shuttle van may work out cheaper. Transiting between Paris-Charles de Gaulle and Paris-Orly airports can be a nightmare on public transportation. For transit passengers, Le Bus Direct coaches are the most convenient public transportation option by far for getting from Orly to Charles de Gaulle airport or vice versa. Le Bus Direct Line 3 coaches connect Orly Airport and Charles de Gaulle Airport (CDG) two to three times per hour between around 6 am and 10:30 pm. Transit traveling time between the two airports is around 1h15 minutes. The one-way fare for Le BUs Direct Line 3 airport transit buses is €21 (€36 return) and for children €13 (€26 return) irrespective of which stop is used. Groups of four or more pay €16 one way – for larger groups a taxi or private shuttle van may work out cheaper. An alternative to Line 3 is the RER train line B but traveling time between the two airports will take well over an hour and require transfers. Taxis or a private shuttle may be cheaper than a missed intercontinental flight and may well work out cheaper for small groups too – the break even point is usually 4 or 5 traveling together. Le Bus Direct coaches are a comfortable option for especially solo travelers. Small groups may find better value in pre-booked private airport shuttle minibus services – but do compare prices first. Taxi2Airport and Suntransfers give online quotations for private airport transfers without first requiring personal details or flight numbers. Public transportation options to Charles de Gaulle and Orly airports are plentiful and cheaper but often take longer and require some transfers not designed with luggage schlepping intercontinental passengers in mind.